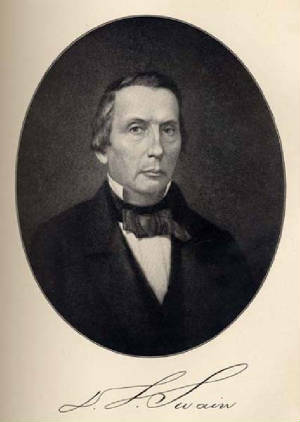 David Lowry Swain (1801-1868) was Governor of North Carolina from 1832 to 1835 and President of the University of North Carolina from 1835 until 1868. Original portrait, by William G. Browne, property of the Dialectic and Philanthropic Societies Foundation, Chapel Hill, North Carolina. Courtesy of the University Library, University of North Carolina at Chapel Hill. David Lowry Swain (4 Jan. 1801-29 Aug. 1868), lawyer, governor, and educator, was born in the Beaverdam area near Asheville in Buncombe County. His father was George Swain, a Massachusetts native who settled in the Georgia frontier, married, and served in the legislature and the constitutional convention of 1795 before moving to the North Carolina mountains for his health. His mother, Caroline Swain, was the daughter of Jesse Lane, member of a well-known North Carolina family, who moved first to Georgia and then farther west. Her first husband, by whom she had four children, was David Lowry, who was killed during an Indian raid in Georgia. She and George Swain had seven children, of whom David Lowry Swain was the youngest. In North Carolina George Swain was a small farmer before moving into Asheville to become postmaster, hat manufacturer, justice of the peace, academy trustee, town commissioner, and self-taught physician. The boy David was taught by his father until he entered the Newton Academy, conducted in Asheville by successive Presbyterian ministers. He was a good student and after completing the course remained at the academy for a time as instructor of Latin. His father, ambitious though not affluent, encouraged his wish to become a lawyer, and in 1822 David left home to prepare for the bar. He was examined by the faculty of The University of North Carolina and admitted to the junior class. Older than most of the students and somewhat disappointed in the university, as well as impatient to complete his studies and reluctant to spend his family's limited resources unnecessarily, he withdrew after only one week in order to study law in Raleigh at the school of Chief Justice John Louis Taylor. In 1823 Swain returned to Asheville with a law license and the friendship and favorable opinion of some of the state's leading men, including Taylor, Joseph and Weston Gales of the Raleigh Register, and Taylor's brother-in-law, the prominent lawyer-politician, William Gaston. He began to practice in Asheville and the western circuit and soon became active in the political campaigns of his half brother, James Lowry, who was elected to the state House of Commons, and of his friend, Dr. Robert Brank Vance, who won a seat in Congress. Party affiliations were determined chiefly by preferences in the national presidential elections, and Swain followed most of his friends and associates in opposing the People's ticket, which supported first John C. Calhoun and later Andrew Jackson. The success of the People's ticket in North Carolina placed Swain in the minority of the state and his own county as far as national politics was concerned, and when he ran for a seat in the House of Commons in 1824, he emphasized local issues and avoided the question of the national president. He was successful; Buncombe County voters sent him to the House of Commons five times (1824, 1825, 1826, 1828, and 1829). In 1827, when the General Assembly elected him solicitor of the northeastern circuit, he did not run for the legislature. A year later he resigned as solicitor to return to Asheville because of his father's illness; he then served two more years in the house but declined to be a candidate for a sixth term in 1830. In the House of Commons, Swain became known as a champion of western interests, which in those years concerned mainly efforts to create new western counties. Also demonstrating his belief in an active government seeking to improve conditions in the state, he initiated or supported measures related to internal improvements. Both as lawyer and as legislator he tried to protect western settlers whose land titles were disputed either by Indian claimants or by holders of large speculative land claims, an undertaking that naturally made him popular in the west. On a number of issues not strictly sectional, however, Swain agreed with a conservative viewpoint more prevalent in the east. He was a "sound money" man who favored conservative banking practices through privately controlled banks. Himself a member of a family active in local government, he did not support the movement to increase the popular election of local officials. His votes on questions related to the control of slaves and free Negroes were in accord with those of eastern slaveholders. Although recognized as a western leader, Swain was moderate, willing to compromise, and friendly with persons of all sections. Unsympathetic with the majority that supported Andrew Jackson, he was noncommittal on national politics. In February 1826 Swain married Eleanor White, the daughter of the former secretary of state, William White, and of his wife Anna Caswell, whose father was the Revolutionary governor Richard Caswell. The marriage strengthened Swain's ties with eastern and central North Carolina. His wife was unhappy in Asheville, and when the legislature sent Swain to the superior court bench in 1830, she lived in Raleigh with her sisters and widowed mother while her husband traversed the state on his rotating circuits. In December 1832 the General Assembly tapped Swain to serve a one-year term as governor of North Carolina. His election was a surprise to most people, for he had not been mentioned in the preelection speculation. He was chosen by a coalition of westerners, National Republicans, and advocates of states' rights who were united only by their opposition to the leading candidate, a prominent eastern Democrat. Swain thus had no hope of effective party support during his term. The governor's powers and duties were slight, and he was expected to be largely a social figurehead. Even for that limited position Swain seemed poorly endowed, for his face was long and homely, his slender figure was ill shaped and ungainly, and his movements were awkward. His advantages were an imposing height of six feet two inches, a kindly and intelligent face, and a courteous, genial, and witty personality that made him a welcome companion. In addition, he was considered a well-prepared, persuasive debater and public speaker. By custom the governor could make recommendations in an annual message and other special communications, but the all-powerful legislature was free to ignore them. Without strong party support, Swain would need great personal influence if he were to accomplish anything, and here he proved to be extremely effective, excelling at careful management and negotiation to achieve his objectives. By the end of his year in office, he was highly popular and some informed leaders thought him the most influential man in North Carolina. During the second half of 1833 Swain led an unprecedented popular campaign on behalf of state aid to railroad construction. He served as president of an internal improvements convention held in Raleigh in July and during the following months traveled throughout the state to speak for the movement at local conventions. In his annual message to the legislature in December 1833, he threw out a challenge for improvement and reform in many areas of state government. He proposed the revision and codification of state laws, practical banking charters, the drainage of swamplands belonging to the Literary Fund and their sale for the benefit of a public school program, and tax reform, including revised assessment laws, a decrease in the poll tax, the adoption of an income tax, and increased revenue to support constructive activity. The message emphasized the need for railroad construction. It was soon followed by the recommendations of a second internal improvements convention, over which Swain presided and by the report of the Board for Internal Improvements, which he wrote as chairman. In all of these proposals Swain advocated state construction of two basic lines: the central east-west line and a north-south line that would bisect the central line, with feeder lines and canals to be built by private companies in which the state would buy stock. During the legislative session Swain also forwarded with a strong recommendation a western proposal for constitutional reform. The General Assembly reelected Swain as governor for another year without opposition; passed two measures he had initiated as a legislator, the creation of a new western county from Buncombe and Burke and the establishment of a commission to revise and codify state laws; and adopted the banking system he advocated. These actions were gratifying, but more important needs were ignored. Nothing was done for a state system of railroads, tax revision, public education, or constitutional reform. Concluding that increased legislative power for the underrepresented and dissatisfied west must precede any far-reaching reform, Swain and his supporters made constitutional revision their major aim in 1834. The campaign strategy differed from that of 1833 in that Swain was less openly active, but he and other proponents of change worked all year to win the necessary eastern votes. In the meantime, the opponents of Andrew Jackson were trying to form a new national Whig party, and in North Carolina the diverse elements of nationalist and states' rights leaders set as their goal the defeat of staunch Jacksonian Bedford Brown for reelection to the U.S. Senate. Swain, their chosen candidate, wanted the office but feared that he would lose. By the time the legislature met, he had correctly assessed its membership as dominated by Democrats; he did not oppose Brown, who was easily reelected. Swain's message of 1834 reiterated his proposals of 1833 but was notable chiefly for its persuasive argument for constitutional reform. In addition, calling attention to a national issue previously little noticed in North Carolina, he endorsed the policy of distributing to the states the proceeds of national land sales, with North Carolina's share to be used for internal improvements and public schools. This became a Whig policy popular in North Carolina. The more partisan Democrats endorsed a well-liked eastern Democrat to oppose Swain's candidacy for a third gubernatorial term, and Swain was reelected by a slim majority after three ballots. He in turn abandoned his noncommittal attitude and openly affiliated with the new Whig party even though it was a divided minority. Party feelings ran high as the Democrats used their power to pass resolutions instructing Senator Willie P. Mangum how to vote. Swain worked with advocates of constitutional reform from both parties and both sections to put together a compromise bill that would allay eastern fears while granting some of the western demands, and the bill calling for a constitutional convention was adopted. After the convention was endorsed by popular vote, Swain was elected a delegate from Buncombe County and was thus able to play a leading role in the convention of 1835. His two major goals at the conference were to achieve for the west the maximum representation that the convention act permitted and to remove from the constitution all religious disqualifications for office holding. After a powerful speech in which he abandoned his usual moderation to threaten revolution, he won his first point. Swain only partially achieved his second goal; the convention retained the religious test but removed the disqualifications for Roman Catholics. Believing that the west owed a debt to the boroughs for their support of the convention movement and that the borough representatives had been leaders in advocating constructive legislation, he strongly opposed the convention's decision to eliminate borough representation. In spite of his disappointments, Swain endorsed the amendments as a whole because he thought the change in representation was essential to progress in the state. Governor Swain spent the last few months of his term working with Mangum to win support for the Whig party, but with the Whig strength in the west underrepresented they could not overcome the Democratic lead in the legislature. The General Assembly of 1835, the last under the old system of representation, was hostile to Swain and quickly chose as his successor the Democrat he had defeated in 1832. Even less attention than formerly was paid to Swain's recommendations for constructive action. Nevertheless, he left office with hope for the future, for one of his last official acts as governor was to proclaim the amendment of the constitution by majority vote in the statewide referendum. In December 1831 the General Assembly elected Swain a member of the board of trustees of The University of North Carolina, an appointment that could last for life if the incumbent remained active. The next year, as governor, Swain became ex officio chairman of the board. He took his duties as trustee seriously and worked with others to improve the institution, which was unpopular, was inadequately financed, and had a small and declining student body. Several effective measures were implemented: the organization of an executive committee of the board improved efficiency; the sale of university-owned land in Tennessee provided the capital for a small but regular income, and standards were raised by new admission requirements. Joseph Caldwell, the university's respected longtime president, died in 1835, and the position was not filled for most of the year. Swain, needing employment as his gubernatorial term ended and reluctant to return to the practice of law on the western circuit, sought the post. He was hardly the "distinguished literary gentleman" the board had hoped to employ, but influential trustees concluded that the institution's real need was for a good manager who could improve its popularity and effectiveness, and Swain was elected. In January 1836 Swain moved to Chapel Hill to assume his new duties. He thus withdrew from the political field, for he was aware that the university needed bipartisan support and should not be embroiled in political rivalry. His sympathies remained with the Whig party, and he probably intended to return to politics at a later opportunity. Occasionally his friends considered nominating him as a candidate for governor or U.S. senator, but such proposals came to nothing, and Swain remained at the university for the remainder of his life, filling the longest term of any university president. Most of the faculty, although naturally surprised, even affronted, that their new head was not to be the scholar they expected, soon accepted Swain and came to respect him. The little institution had no place for a president who was solely an administrator, and Swain became professor of national and constitutional law, instructing the seniors in legal and constitutional history, legal and political theory, and ethics, which he called "moral science." Critics charged that under his administration standards of scholarship were low, the institution emphasized the preparation for public life rather than sound education, the library was neglected, laboratory work in the sciences was deficient, the curriculum was old-fashioned and superficial rather than intensive and thorough, and discipline was too restrictive and juvenile in theory and too lax in practice. Yet many of the same critics also thought Swain was efficient, admired him personally, and were fond of him. His administration and renewed prosperity for the university and the state did produce the popularity and growth that the board wanted. By the end of the antebellum period enrollment stood at nearly five hundred, the largest of any southern institution, with students drawn from throughout the South. New buildings were erected, one of them designed by a nationally acclaimed architect; the campus was improved; both curriculum and faculty were enlarged; and the university's loyal alumni filled the most important state offices. Such scholarly interests as Swain had were in history, where he concentrated on the study of North Carolina and the collection of source materials for the history of the state. He established at the university the North Carolina Historical Society, with the faculty as officers and himself as the moving spirit, and collected important newspapers and manuscripts in the society's name. It was long his intention to visit England to acquire copies of documents related to North Carolina, a plan endorsed by the General Assembly. However, he was unusually dilatory in beginning the project, and with the onset of the Civil War it was forgotten. Although personally tolerant of opposing political and religious opinions, Swain was anxious to keep the university free from the controversies of the day. Accordingly, with the full support of the board of trustees he insisted that students and faculty alike refrain from public endorsement of controversial political and religious views. When Benjamin S. Hedrick, a faculty member he liked and had aided as a youth, admitted and defended in the newspapers his preference for the Free Soil party in 1856, Swain not only disagreed with the opinion but also disapproved of the expression of it. Although he legalistically protested that the executive committee, in dismissing Hedrick, usurped authority belonging only to the full board and remained friendly with Hedrick then and later, he did not champion, perhaps was not even familiar with, the principle of academic freedom. As an old-time Whig with Unionist attitudes, Swain was hopeful until the last that secession and civil war might be prevented, and in February 1861 he led a delegation sent by the legislature to meet with representatives of the seceded states in Montgomery, Ala., in order to seek a reconciliation through compromise. By the time the delegation reached Montgomery the Confederacy had been formed, and instead of discussing reconciliation the Confederates tried to win over the commissioners to the Southern cause. The delegation returned home to report failure. During the Civil War Swain was a loyal though reluctant supporter of his state and region and a trusted adviser of his friend and protégé, Zebulon B. Vance, but he devoted most of his efforts to keeping the university alive, seeking exemption from conscription for university students and refusing to cease operations despite hardships. Most of the students left for the war, as did the younger faculty members, and Swain and the older professors remained to teach a few students too young to enlist, exempt because of ill health, or discharged because of war injuries. Through his determination, the university remained open and held commencement exercises every year of the war. As William T. Sherman's army reached the center of North Carolina, it was Swain and his old friend William A. Graham who met with the general as representatives of Governor Vance to request protection for Raleigh and the university. Sherman was conciliatory to the two old Unionists; Raleigh was not destroyed, and the university was not vandalized. Swain, always the negotiator and compromiser, expected that Southerners willing to accept the failure of secession and the end of slavery would join with Northerners to restore peace to the warring country. At the invitation of President Andrew Johnson, he went to Washington as one of several consultants on Reconstruction policy, but he opposed Johnson's plan to replace the elected Vance with an appointed governor and could not accept the leadership of William W. Holden, the former Democratic fire-eater who had reversed his position late in the antebellum period to oppose secession and lead the wartime movement for a separate peace. Even so, Swain hoped for reconciliation with a minimum of difficulty. He attempted to make up for the loss of the university's endowment by securing aid from the state's share of the Morrill Land Grant fund, and he worked well with Jonathan Worth, another former Whig, who was elected governor during presidential Reconstruction. Swain underestimated the force of political extremism. In spite of the largely Unionist board and faculty, the students had been overwhelmingly Southern in sympathy and the Republicans considered the university a hotbed of Secessionists. Many North Carolinians, on the other hand, felt that the university had given little support to the Confederacy; they thought Swain's readiness for peace, his acceptance of a horse as a gift from Sherman, his giving his daughter a wedding to Illinois general Smith D. Atkins, who commanded the troops occupying Chapel Hill, and his invitation of President Johnson to the commencement of 1867 to be betrayals of the South. Bankrupt, with no effective political support, only a few students, and a handful of loyal but aging professors, the university was in great danger. Some of its trustees and alumni, concluding that a thorough change in the plan of education was required, recommended an elective system based on a number of different schools modeled after the organization of the University of Virginia. Swain and the other faculty members tendered their resignations to facilitate the new plan; the board adopted it, effective in the fall of 1868; and the faculty was asked to remain until replaced or reelected. These efforts to save the university by a change in educational policy were ineffective, for political control proved to be more important. Under congressional, or radical, Reconstruction, a new state constitution was adopted, providing that the old board would be replaced by a new one chosen by the Board of Education. The old board, at its last meeting in June 1868, reelected the old faculty. The new board, at a meeting in July attended by Swain, heard reports of the old officials courteously but met again the next day without them and accepted the faculty resignations despite their withdrawal. Swain, troubled by deafness, less politically astute than previously, and unable to gauge political animosities so foreign to his own temperament, was shocked and hurt by an outcome he had not foreseen. He wrote a long legalistic protest but was ignored. An accident cut short any further effort at resistance and prevented his forcible ouster. On 11 August he was thrown from a buggy pulled by his "Sherman" horse, severely shaken up, and confined to bed with shock and weakness. He seemed to be recovering and sat up briefly on the twenty-ninth but died shortly after returning to his bed. Swain's funeral sermon was preached by his old friend and former pupil, Dr. Charles Phillips, professor of mathematics and minister of the Presbyterian church of which Swain was a member. He was buried in the garden of his home in Chapel Hill but was later reinterred in Oakwood Cemetery, Raleigh, survived by his wife, his daughter Eleanor Swain Atkins, and his son Richard Caswell Swain, a physician. Two infant sons and his oldest child, Anna, who died in 1867, had predeceased him. Swain, who had always been a careful manager, had invested his savings and his small inheritance wisely, and had been successful in land purchases, left his widow a substantial estate for his day, valued at approximately $60,000. To his state he left a legacy of constructive political achievements and of devotion to the university and kindliness to its students that earned for him a warm place in the memories of alumni as they struggled to rebuild the university in the years that followed. There are two portraits of Swain at the University of North Carolina at Chapel Hill. Recommended Reading: Encyclopedia of North Carolina (Hardcover: 1328 pages) (The University of North Carolina Press), Description: The first single-volume reference to the events, institutions, and cultural forces that have defined the state, the Encyclopedia of North Carolina is a landmark publication that will serve those who love and live in North Carolina for generations to come. Editor William S. Powell, whom the Raleigh News & Observer described as a "living repository of information on all things North Carolinian," spent fifteen years developing this volume. With contributions by more than 550 volunteer writers—including scholars, librarians, journalists, and many others—it is a true "people's encyclopedia" of North Carolina. Continued below. Recommended Reading: Bluecoats and Tar Heels: Soldiers and Civilians in Reconstruction North Carolina (New Directions in Southern History) (Hardcover). Description: In Bluecoats and Tar Heels: Soldiers and Civilians in Reconstruction North Carolina, Mark L. Bradley examines the complex relationship between U.S. Army soldiers and North Carolina civilians after the Civil War. Continued below..